There’s no doubt that the arrival of a new baby to a family brings schedule changes and requires extra work and flexibility from everyone. 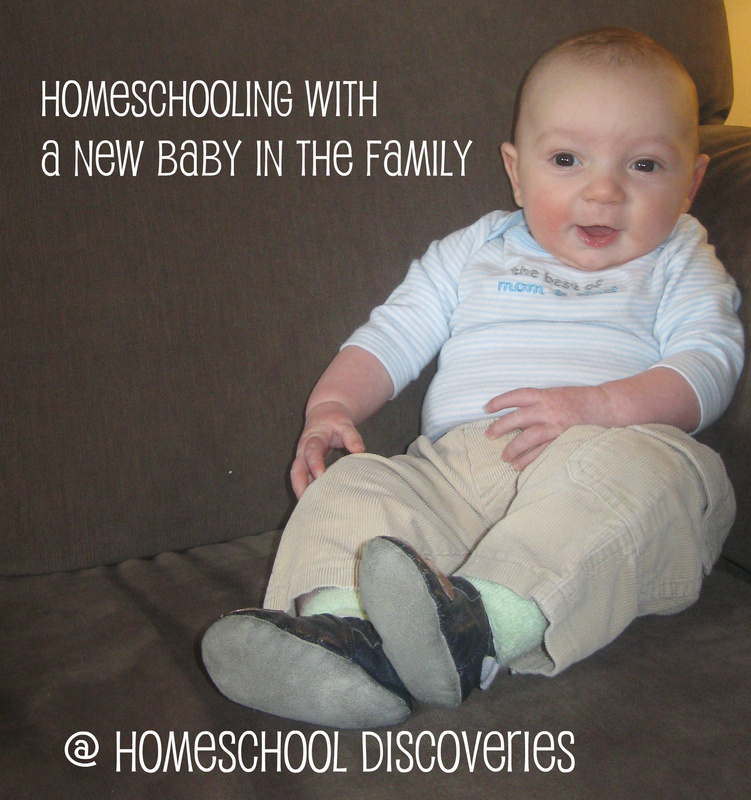 Homeschooling is so wonderfully flexible, and many families chose to take an extended school break of some sort when a baby arrives. When baby J arrived 3 months ago, we decided that extended time off wasn’t the best option for us. While learning can certainly take place at any time, our formal school time is an anchor to the routine in our day. We also didn’t want Miss M to lose valuable progress she was making in learning addition facts and telling time. And I really enjoy teaching my children (most of the time, anyway!). I planned our schedule for the year to accommodate taking two weeks off. But then Tony suggested that he could be my “substitute teacher” while he took his two weeks off of work. We decided this would be a unique opportunity to not only maintain some routine in the face of all the other changes a new baby brings, but also for him to bring his perspective and ways of explaining things to the table. 1. Have a thankful attitude and realistic expectations. I knew that, especially at first, we might not get as much school work done as we had before baby J was born. I let Miss M (our oldest — 7.5 years old/2nd grade) know what my priorities were (doing at least a few basics every day during the first couple months). I wanted her (and I) to be thankful for what we were able to accomplish, not focused on what we were not getting done. 2. Do read-aloud subjects while the baby eats. If you are stuck sitting on the couch anyway, why not read? I’m not the type to follow very much of a schedule at first for the baby’s feedings. So, when the baby gets hungry, we often stop whatever else we’re doing and move to the couch to read history or other read-alouds. 3. Make a daily to-do list of independent work. Maybe this is something you do anyway! For us it, was something new. Rather than have Miss M ask me for another thing to do after finishing one thing, I now make her a list of all the things she can do on her own on that day. Sometimes she does all these things, and then comes to get me for the subjects we do together. Other days these independent items are checked off the list here and there while I am taking care of needs that come up for the other kids. 4. Make a weekly plan of school work to get done for that week. I have to admit that while I made an overall schedule for the year, each week (before J was born) I rarely made a list of what I was specifically hoping to accomplish. With tiredness or crying baby or potty training toddler to distract me (yes, we are crazy enough to be trying to potty train our almost-three-year-old while having a small baby! ), it helps to have it all charted out. Right now I’m using the daily assignment sheet printables from Homeschool Creations to plan my week. I know they are meant to be a student assignment sheet, but I think they are cute so I am using them for me for right now. 🙂 I write in pencil, so it’s easy to change things up and be flexible if needed! 5. Do the subjects requiring the most focus while the baby sleeps. Even though a tiny baby (assuming he/she isn’t crying) is not much of a distraction to school work, I find that I am more focused on teaching if I am not holding baby J while doing math lessons in particular. I guess I would sum up these five tips as “Be Flexible!” By being flexible and making school a priority in our day, we’ve found it to be very possible to make progress toward our academic goals over the past three months since baby J joined us. Now getting the house clean and surviving taking all the kids to the store…I might have to read someone else’s tips on that. Tomorrow, I’ll post what a “day in the life” looks like for us! What an amazingly inspirational post! Our Mr J is about to turn 3, and I think he would really benefit from a structured pre-school time. I am super excited to see tomorrow’s post on a day in the life!